Insights in Excel: Insights will analyze your data and return interesting visuals about it in a task pane. 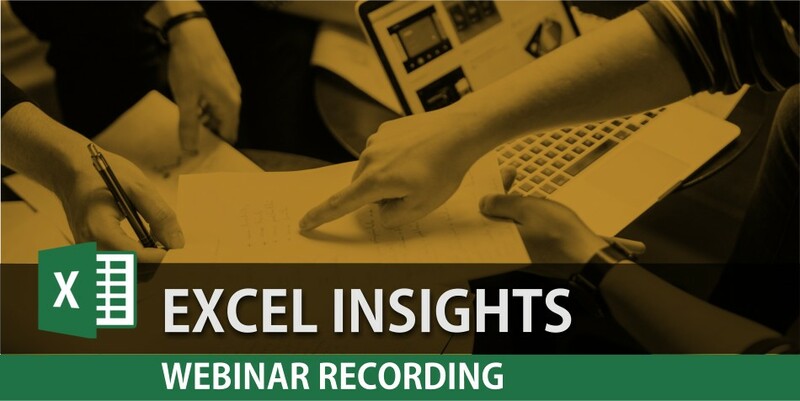 Insights in Excel is a new feature of Excel 2016 with an Office 365 subscription that give you fast, automated, insightful analysis of your data. Excel’s PivotTables are great, but sometimes we get subtotals within subtotals and you want to lose only the 2nd subtotal. Extracting email address from a text string in Excel can be tricky. I made a video demonstrating three methods of extracting the email addresses. There are over 10 reasons to use Tables in Excel instead of a data range. Here are five reasons along with a training video. There is part of the free course I created for the GSCPAs. The CTRL key is used to select non-adjacent ranges which is a handy feature for charts and summing ranges. You can now deselect with the CTRL key. Huge improvement in Excel. Create a break-even analysis with multiple products in Excel. Create a contribution margin income statement using a product mix. To master Microsoft Excel, you must know how to use array formulas. Array formulas can perform calculations that you can't do by using non-array formulas.